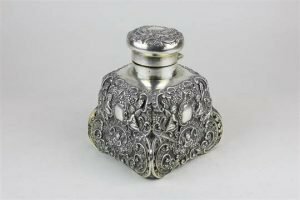 A silver plate mounted travelling glass bottle with embossed cherub, floral and scroll motifs and vacant cartouche. 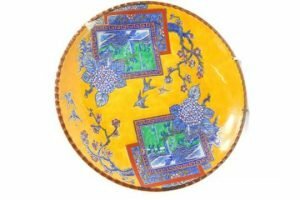 A 20th century Japanese Taisho plate, the circular body decorated with panels, birds and flowers on a yellow ground, unmarked. 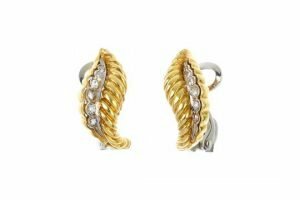 A pair of mid 20th century diamond ear clips, each designed as a brilliant-cut diamond scrolling line within a bi-colour surround, with tapered spiral side. 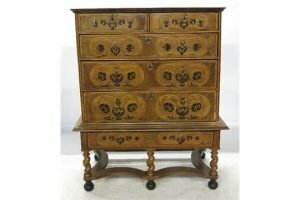 Estimated total diamond weight 0.15ct. 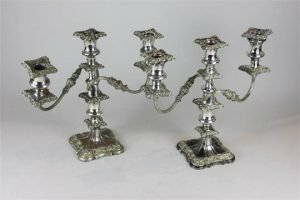 A pair of silver plated three-light candlesticks, with ornate, foliate and scrolled borders, on baluster stems and square bases. 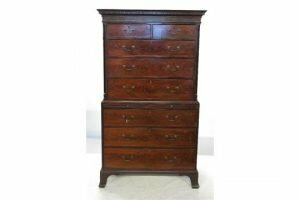 A Georgian mahogany chest on chest, the upper section fitted with two short over three long graduated drawers, below a blind dentil cornice, the base with brushing slide over three long drawers, raised on bracket feet. 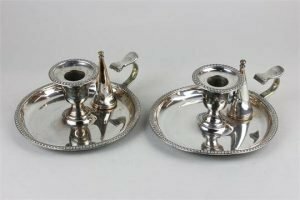 A pair of 19th century silver plated chamber sticks with gadroon border, with insignia to handle, maker J W Thomas & Son. 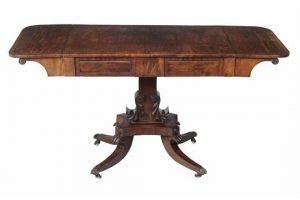 A George IV mahogany and cross banded sofa table, circa 1825, the rectangular top with rounded corners above two blind frieze and opposing dummy drawers, on carved stem with decorative S-scrolls above canted platform and scrolling out swept legs, terminating in brass lion paw caps and ceramic castors. 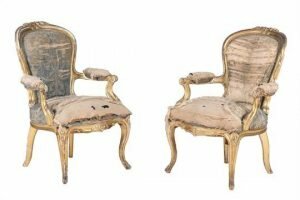 A pair of William IV carved gilt wood armchairs, circa 1835, each balloon shaped back carved with flowers, the padded arms with scroll terminals, each serpentine seat on moulded cabriole legs. 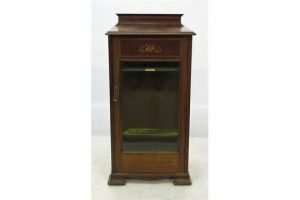 A late 19th century Edwardian mahogany music cabinet, with satinwood and box inline inlay. 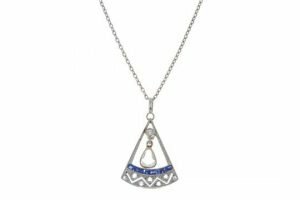 A diamond and synthetic sapphire pendant, the pear-shape rose-cut diamond suspended from an old-cut diamond collet, within a calibre-cut synthetic sapphire and rose-cut diamond triangular panel. 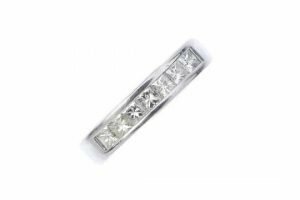 A diamond seven-stone ring, the square-shape diamond line within a channel-setting, to the plain band. 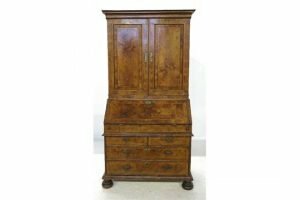 Estimated total diamond weight 0.50ct. 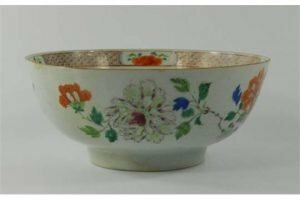 A late 18th century Chinese famille rose porcelain bowl, decorated with typical flower and rock design to the exterior, the interior with a diaper band. 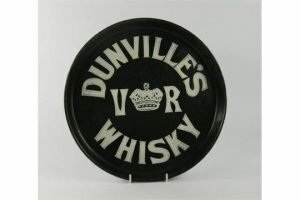 A Victorian green enamelled tray, designed for Dunville’s Whisky, and made by Richard Patterson and Co of Belfast. 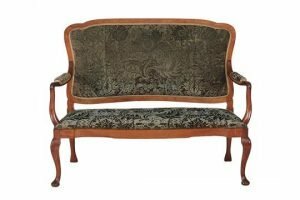 A Continental walnut sofa, 20th century, the shaped back upholstered in green velvet leading to open arms, drop in seat, and cabriole legs. 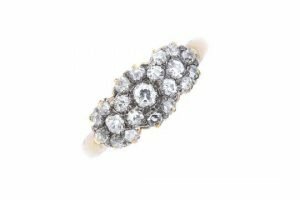 A mid 20th century 18 carat gold diamond triple cluster ring, the graduated old-cut diamond triple clusters to the plain band. Estimated total diamond weight 0.75ct. 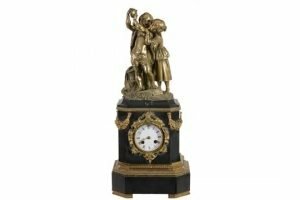 A French black marble and gilt metal figural mantel clock, late 19th century, the case of plinth form with decorative scroll cartouche bordering dial, flanked by floral festoon decorated canted angles beneath surmount, cast as a young peasant boy and girl within naturalistic setting. 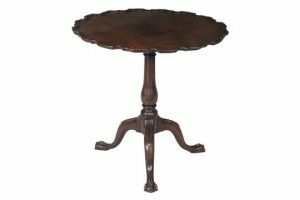 A George III mahogany tripod table, the top with piecrust edge above a turned baluster stem and three acanthus carved down swept legs, terminating in claw and ball feet. 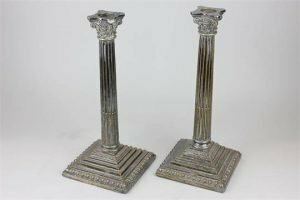 A pair of silver plated Corinthian column candlesticks on square stepped bases, with egg and dart border.